Flexibility and agility are the keys to success for TD Bank. Bob Fox: Can you give a description of TD Bank, your role, and what TD Bank is up to? Scott Hite: At a high level, TD Bank Group is headquartered in Toronto, Canada, with more than 85,000 employees in offices around the world. TD offers a full range of financial products and services to more than 25 million customers worldwide. On the U.S. side, TD Bank, America’s Most Convenient Bank, is one of the 10 largest banks in the U.S. serving more than 9 million customers from Maine to Florida, with 26,000 employees and a full range of retail, small business and commercial banking products and services. The U.S. headquarters is in Cherry Hill, New Jersey. In my role, I look after the Enterprise Real Estate Strategy, which encompasses North American architecture and design, corporate and retail workplace standards, innovation, and real estate environmental sustainability / wellness. Can you give insight into the demographic of TD Bank such as your locations, culture, and people across the organization? On the corporate real estate side, we have about 11 million square feet in 180+ corporate locations throughout North America which equates to about 7 million square feet in Canada and 4 million square feet in the U.S. We have about the same balance of retail stores and branches to corporate office space, with 11.5 million square feet across North America in more than 2,300 branches and stores. I was excited to hear about some of the concepts you are starting to employ across the organization. Could you share some insight on what you’re doing and what you’re trying to accomplish? The financial services industry has historically been quite conservative and traditional, using workplace as a commodity. But now we’re seeing a lot of competition for talent from progressive start-ups and technology companies coming into the banking space, so we are taking a human-focused approach in creating workplaces that offer unique and exceptional experiences for our employees. Workspace is now a distinguishing factor for TD to attract and retain talent. Can you describe some of the features of the workplaces that you’re installing around the country? We’ve been in a flexible corporate environment for the past five or so years where employees have been moving away from dedicated desks to shared desks. Now, we’re going beyond desk sharing into more of an activity-based scenario where we provide a mixture of collaborative and focused spaces within our offices. Our employees are at the forefront of everything we do with our workspace, and understanding their happiness and productivity in open work settings is very important to us. We’ve had a lot of discussions and conducted benchmarking research which led us to create a variety of four open settings: open-collaborative, closed-collaborative, open-focused, and closed-focus. We also work with our furniture manufacturers to customize certain products in order to meet specific focused-work needs. We also believe in providing different types of furniture settings within meeting rooms. For example we have casual meeting rooms with sofas and chairs, sit-to-stand meeting rooms where folks can change their posture, and scrum areas without chairs for teams to hold quick huddle sessions. We’re designing on the premise of flexibility and leveraging demountable products to build rooms wherever we can. Then as things change, we can easily adjust the environment. Many of our open work floors are 100 percent hackable, meaning occupants are empowered to physically move desks, tables, and other furniture in order to create the best environment to do their work. If the business wants to cluster a team together, the desks are on wheels and can be moved and reformed. On the activity-based work setting you have – is it a completely unassigned workplace or do people have a home-base that they go to? Right now we have a mix, but I think over the next three years we’ll move to an almost completely unassigned work setting. Most of the buildings where we’ve deployed the activity-based settings are unassigned. There are certain functions in the bank with assigned seating because the nature of the roles requires more process-based tasks and focused work. But, generally, the majority of our people are classified as knowledge workers where the unassigned environment seems to work quite well. We also have a balance of people that can work from anywhere, such as from home, Starbucks, or in the office. We’re trying to enable our people to work wherever they feel most productive and where it makes sense. Do you feel like the majority of employees are gravitating to a place that best supports whatever task they’re engaged in at the particular time? That’s exactly right. It’s been a big cultural shift for us, and there are still obstacles in overcoming traditional thinking. We have a fairly robust change management protocol in place to empower and educate people on the possibilities. We’ve got some work to do to get there, but we’re very much on that journey now. One topic our readers are really interested in is how are you effecting change? I think a lot of organizations today are still in fairly traditional settings trying to transition away from traditional space. Can you share the process that you went through to effect that change? We start at the top. Our executive leaders are great sponsors who are committed to making change and leading by example. We recently completed a project in Toronto where a very traditional executive floor with a significant number of private offices was converted to a completely open environment with no private offices. The leadership team embraced the change and demonstrated the benefits of activity-based space design over hierarchical space assignment. 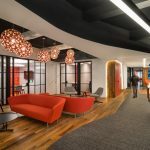 This move allowed us to harvest extra space which we leveraged by adding shared amenities and a technology lab, so the floor now also has very progressive project teams with employees at all levels working on specific short-term project assignments. The employees have direct access and visibility to our senior leadership teams with no barriers from a cultural perspective. Interestingly enough, there is now a desire to increase the density on that floor, and to increase the size of the project teams in the lab space. With the hackable space, we’re actually able to accommodate more desks and more people. We’ve been really successful at leveraging pilot opportunities to test new ideas. It can be difficult for people to imagine something when you pitch it in a PowerPoint presentation; but we’ve found the most success when we can actually deliver and learn from real-life environments. We don’t always get it right, but we always deliver it in a way where we learn and adapt. Can you share one of the lessons you learned? Each time we design a new space, it’s always with our people in mind. There was an example on a floor where we had some permeable meeting spaces, meaning that they weren’t acoustically isolated. Concerns were raised regarding privacy so we went back, took out a demountable wall and built a fixed, insulated wall instead. In other cases, we’ve deployed furniture solutions that folks didn’t prefer, so we watched the behavior in the space and if a certain type of workstation wasn’t being used, we would change it. In reality, how people end up using their work space is always different from theory. So we listen to what employees have to say, we deliver solutions, we watch how the space is used, and then we learn and make adjustments. Our goal is always to innovate with purpose and approach our designs through a continuous, circular, process where we make incremental improvements on every project. Focusing on the furniture and working with vendors to customize, what are some things you are modifying to achieve your goals? We are fortunate in that we have great vendor partnerships and our scale gives us buying power. From an environmental sustainability perspective we do a lot of due diligence around where products and raw materials are being sourced, how they’re being produced, and labor practices. We very much design for the long-term so part of our sustainability perspective is that we want to source the right materials and have long lasting, timeless, and durable products. Our agile teams require a lot of physical movement, but when we deployed linear-shaped sit-to-stand desks, we noticed that the furniture wasn’t being moved in some of the environments. We had a hypothesis that because the furniture was designed with right angles and it lined up nicely, people were hesitant to re-arrange it. We want our employees to feel empowered to be flexible and to move the furniture as their needs change, so we did a test to install furniture with rounded corners that didn’t line up naturally. Sure enough, the customized bean-shaped, sit-to-stand tables were shifted in the environment much more frequently. Where do you think you get the greatest value out of your space? I think it’s in collaborating, connecting teams and building pride in the workplace. We’re taking folks from traditional to an open office, then to a progressive environment and they are happy. They’re proud to talk about their workplace, our culture, and about the company, and I think that’s what excites me the most. Their workplace is an extension of our brand that they directly interact with on a daily basis. There’s a lot more collaboration, discussion, buzz, and energy within some of our progressive environments, and that’s what makes it so impactful. Where are you most willing to spend money in your space? We want to make investments that are timeless. Similar to our retail philosophy, we believe we’re never going to figure out what the future holds so we design a flexible “stage” for the future to unfold. The infrastructure is probably where we spend the most. We want to get the correct air quality and lighting in the space, so the mechanical and lighting infrastructure and the more permanent architectural elements are a big source of the investments, whereas the soft goods or “the props on the stage” require less investment. You’ve embraced the concept of wellbeing. How are you justifying the expense of it? We cautiously spend our money. We have a responsibility to our shareholders, our customers, and our employees so we take a balanced view towards everything we do. We believe in doing the right thing for our people, the planet and our communities and the way that I’ve been able to dip our toe into the water is with piloting. We have two WELL-certified corporate spaces now, and we work closely with Delos. We leverage primarily survey-based data to prove that people feel better, are happier, and are more productive in the space, and we’ve had very good feedback to support that this is the right thing to do. That being said, the premium for WELL certification does move the needle on overall project costs, so we have added to our corporate standards those items of WELL certification that provide the biggest impact. How are you measuring the performance of the space? Is it primarily survey data? We leverage a lot of survey data and we also do observational research. We work with several organizations that periodically go through our spaces to do hot-cold assessments on whether the space is being utilized. They also employ behavioral research methodology on workplace utilization where we go through a period of time to pull the data back and try to aggregate it to make decisions for the future. However, it doesn’t give us insight around the intricacies of behavior, so we leverage the data available and supplement it with technology to get thorough insight on utilization, dwell time, and, more importantly, behavior in space. Tapping into other technological sources has been really productive for us. A simple one is tracking security badge swipes when people enter the building. We track the flow of which groups go where, how long they stay, whether they’re working in the office or remotely, and how often. Wi-Fi is another way our technology group gets good data. From routers people are logged into, we know whether employees are on- or off-site. We’re also exploring technology for sensors in some rooms, furniture and spaces to get micro insight on how people behave at individual workstations. Do you see a big change in people working remotely? What direction is that heading in? It varies by group. When we deliver some of our more progressive projects, the environment is so good we sometimes see people working less remotely. I don’t see a massive exodus to working from home for our group; it’s more about seasonal or days of the week like Fridays and Mondays where employees are more prone to work from home. It also depends on the maturity of teams. As teams adjust to the new ways of working, there’s some relief from needing to be together face-to-face all the time. It’s a trend that’s consistent across the industry. Are you guys employing any sort of co-working programs? We don’t have a co-working program with outside organizations at this point, however we do have environments with multiple lines of business co-working in one shared space. It has actually been quite successful. We’re also looking to create relationships with co-working organizations where we could leverage their space as potential overflow. For example, if we have a spike in technology projects, then we can look to those third party co-working sites to handle it versus leasing a space for fluid requirements. When you look out to the future, what do you see coming down the road for the company? I think the biggest opportunity is around technology enabling a seamless, intuitive work experience. We are evolving our technology and making investments in the infrastructure so that our people feel empowered by having the tools they need to be productive wherever they are without having to think about it. I have an aspiration where we leverage artificial intelligence so that when I get up in the morning and I’m going to go to the office to meet with my team, the technology will tell me how many meetings I have today, who they’re with, and provide me with the most convenient meeting room and scheduling accommodations. That technology and artificial intelligence can provide cues to drive behavior where people don’t have to think about it because all the logistics are handled. I think we learned from the past that we have to take a balanced approach to decision-making. We need to start with our people by spending time with them, listening, communicating, and understanding their needs, desires, and aspirations at all levels. More importantly, observational research is key to advancement. Understanding how to watch people and learning how to use those insights to put strategies in place, and to test them is essential. And you must have executive support to implement things quickly and be willing to change or abandon it and learn from it. Creating lab projects where you can leverage learning from an open strategy is where we’ve been really successful. You’re never going to figure it out, get it made, and deliver it right without a pilot-testing phase, even if it’s as simple as buying Ikea furniture to see how people react and learning from that to develop products appropriate for your employees. That’s my biggest advice on how to promote better change. All photos are courtesy of TD Bank.